Want to start off 2017 better than 2016? Our humble suggestion: Delete everything! This week, we’ll show you how to ditch almost every aspect of your online life, from Twitter to Facebook to Instagram. Today: how to part ways with the company that arguably launched the modern internet. That “don’t be evil” thing is hard to pull off when you have (and ruthlessly protect) an unassailable monopoly on search, browsers, webmail, online video, and display advertising with virtually no oversight or regulation. It’s essentially a massive advertising company — and quietly dismantled one of the major boundaries between its ad-sales side and everything else in October of 2016. Primary-color, cheerful marketing efforts are ultimately kinda depressing, like a preschool teacher with secret problems at home. Has like 178 different chat apps. Kept trying for years to make people join Google Plus. Killed Google Reader, the best RSS reader ever, and the secret reason I’m writing all this. But mainly: Giving all your data to one company is just a massive risk — Google’s security is very good (except when they secretly work with the NSA), but all it takes is one bad data breach for your life to be out in the open. Imagine if everything Google knows about you was suddenly public, from your emails to where you go every day. Feel that full-body shiver of fear? Yeah. Oh, man. I’m not gonna lie to you: You’re going to miss a lot. 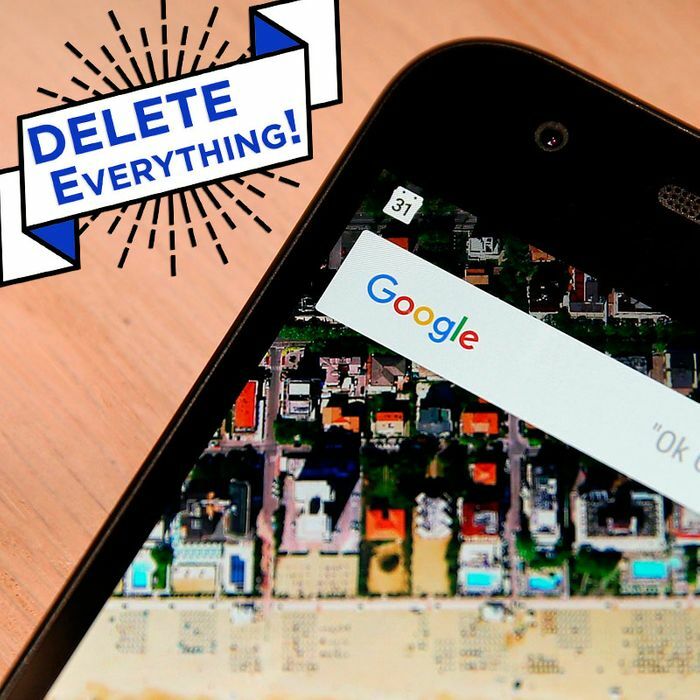 If you’re talking about just the things you’ll cut off if you delete your Google account, that includes: Gmail, Google Docs, Google Drive, Google Photos, Google Calendar, Google Hangouts, and Google Plus (so, you know, not a total loss). If you’re talking about not using any Google or Alphabet product whatsoever, then take a seat. You’ll need to stay away from: Google Maps, YouTube, all Android phones, Chrome (the browser you are statistically most likely to be using right now), most TVs made recently by Asus, Philips, Sharp, Sony, and TCL, Waze GPS navigation, Nest thermostats, that old Blogspot account you never shut down, and the new Google Home. Luckily, since the company is selling its robot subsidiary Boston Dynamics, you can still shove your wicked stupid robot in the chest with a hockey stick without Google watching. Probably. Reading an email about your grandmother’s advanced dementia and seeing an ad for 30 percent off on online mattresses. How much time do you have? Unless you’ve been a strong Yahoo supporter or give speeches about PGP and the inherent weakness of Tor, you’ve probably got a couple of accounts that are owned by Google laying around. Google has made a good push toward unifying all of its services, but deleting them can still be a process. Up next, Google will ask if you want to get rid of a few products or if you want to just do the dang thing and get rid of everything. Before you delete everything, head to https://takeout.google.com/settings/takeout. By default, every service tied to your Google account will be selected. If, for some reason, you don’t care about your Google Circles information, you can pick and choose what you want to download. But grab everything important and have Google email you a zip file of it. Then, you can do the deed. You’ll need to check some boxes agreeing that you understand what you’re doing (Google treats you leaving their embrace a bit like a parasailing company run out of Cancun — there is a lot of “are you sure?” language). And then, boom, done. Except! You probably have other Google accounts. Your YouTube account, for instance. Or your Waze account. Or your Nest and Dropcam account. The list goes on — and is growing larger every day. It’s not that Google is necessarily a bad company — it’s just that it’s so large and contains so much information about you that it would be devastating if it were ever breached. If you’d rather avoid those headaches down the road, that’s all the more reason to step away from Google now.